Hello, dear artists and welcome to the drawing lesson on how to draw a Tesla Model S – probably the most advanced car of our time. This car is very different from such stylish cars as Mercedes-Benz, BMW or Ferrari – this is the world’s first full-fledged electric car. At the first step in drawing lessons about cars we always outline the basic contours of our future vehicle. Apply very soft and smooth lines in this step. 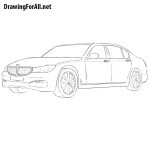 This is also a very standard step of all our drawing lessons about cars – we sketch out wheel arches with the help of curved lines and the wheels themselves with the help of ovals. So, it’s time to add details, and as always we will start doing this from the front of the car. At first draw out the headlights and hood. Draw out an oval radiator grille with a logo of tesla inside. A little lower we draw out additional radiator grilles. But it is worth noting that this is just fake radiator grilles. We go a little higher and draw out the roof using smooth curved line. Next draw out the windows and side mirrors. Continue the roof line and draw the trunk. 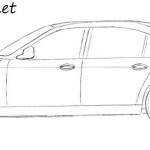 Go a little lower and draw out the doors of our Tesla Model C and the bottom edge of the car. At the end of the step draw the unusual door handles. Very carefully draw out the wheel arches and the wheels inside the arches. Note that the lines should be as smooth as possible. 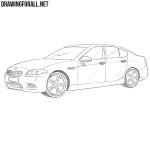 A very simple step in which we draw out the wheel rims (which can be any shape) and add shadows using light hatching. 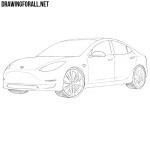 Here is our drawing lesson on how to draw Tesla Model S came to an end. 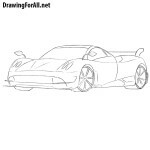 Do not forget to visit our “cars” category where you will find a lot of interesting drawing lessons. Share this and other lessons and subscribe to us in social networks.